It is said that festive character Santa visits hundreds of homes every second in order to deliver all the world’s presents on Christmas Eve. Luckily, Hyster Europe has the solutions to support highly efficient warehouse and delivery processes during the busy holiday period, not just for Santa, but for applications experiencing an explosion of online ordering and high street sales. 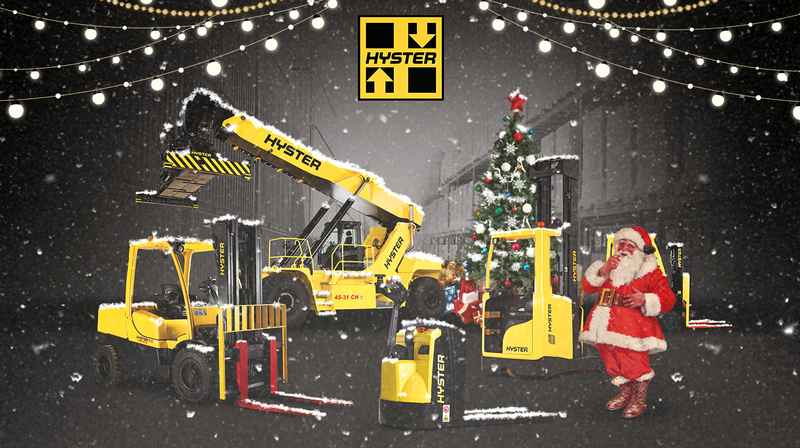 Here are several ways that Hyster® solutions can help deliver a magical festive season. Santa’s deliveries can’t be late, and neither can millions of other orders over the holiday season. All Hyster® trucks are built for tough applications where reliability is essential. Local Hyster® dealers are on hand across the world to support the supply chain. You can depend on Hyster® trucks to help transport the gifts no matter who is delivering them, whether it’s Santa in the UK, La Befana in Italy, Pere Noel in France, Los Tres Reyes Magos in Spain, or Ded Moroz in Russia. New noise reduction options are available on Hyster® powered pallet trucks. Not only does this improve operator comfort, but it could help enable the quiet delivery of presents during the night, without waking up the children. Santa’s operation faces peaks in seasonal demand more than most enterprises. However, regardless of the tough application, Hyster® dealers are on hand to support your operation with short term hire of extra equipment, both during the peak festive season, and throughout the year. It gets cold across most of Europe in late December, so Hyster® trucks can help drivers, and elves, to stay warm in their lift truck cabs with heaters. Plus, there is lighting options for operation during dark nights. Christmas gift trends and fashions change every year, so the Hyster® warehouse simulator tool helps to simulate throughput in busy warehouses and optimise equipment usage long before the seasonal rush. Appropriate solutions to handle awkward or multiple loads can be simulated. During the seasonal food and beverage rush, cold store cabs help keep operators (and elves) warm. Damage avoidance solutions on Hyster® trucks help keep the goods at their best, and intelligent lift on pallet trucks help to speed up cross docking for on time despatch and delivery. Apparently more than 200,000 miles of wrapping paper is used in the UK alone every year (the earth has a circumference of 25,000 miles). The right Hyster® trucks and paper clamps help lift jumbo paper rolls before they are magically transformed in to colourful, glittery rolls of wrapping paper. Like Santa, many businesses have manufacturing and logistics operations spread over multiple sites. To help provide convenient, automated fleet management, various types of trucks can be fitted with the Hyster Tracker telematics system. Managers can then keep track of the equipment usage, even seeing breadcrumb trails of their movements. With Hyster Tracker, Santa’s sleigh can even have restricted access. This means it can only be driven following a pre-shift check before the big night, just like a lift truck fitted with the Hyster Tracker telematics system. Then when all the presents have been unwrapped, Hyster® cool trucks are there to support recycling centres by helping trucks to keep going without getting clogged up with dust and debris from all the wrapping paper and packaging. We wish all busy seasonal applications, including Santa, the best of luck during the festive season. This entry was posted in Attachments, Big Trucks, Container weighing, Cool Truck, Counter Balance, Cross-Docking, Dealers, Electric Big Trucks, Electrics, Fuel Efficiency, Hand Pallet Trucks, Hyster Tracker, Intensive Applications, Paper Handling, ReachStacker, Recycling, Reduced Noise Levels, Solution, Warehousing, Wireless Asset Management and tagged Attachments, Christmas, Container Handlers, Container weighing, Counter Balance, Ded Moroz, Fuel efficiency, Hyster, Hyster Europe, Hyster Tracker, La Befana, Los Tres Reyes Magos, Paper Handling, Pere Noel, Recycling, Santa, Telemetry, Warehousing, X-Mas. Bookmark the permalink.